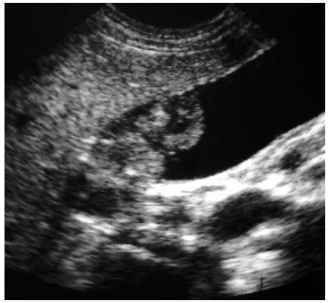 US is the method of choice for the diagnosis of gallbladder disease. 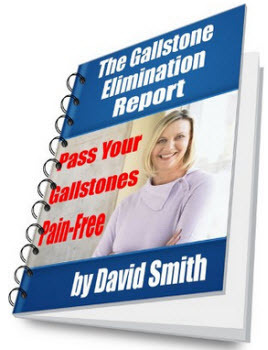 Its sensitivity for gallbladder calculi approaches almost 100%, and it is also very well suited to evaluate changes of the gallbladder wall. Cholesterol polyps are small, benign lesions that adhere to the gallbladder wall. They appear as hyperechoic structures of 12 mm and may be easily distinguished from calculi, since they cast no shadow and are immobile (Fig. 7). The diagnosis of acute cholecystitis is usually made on the basis of clinical and radiologic criteria. The 'sono-graphic Murphy's sign' refers to the maximum point of tenderness, which is correlated to the gallbladder at US. 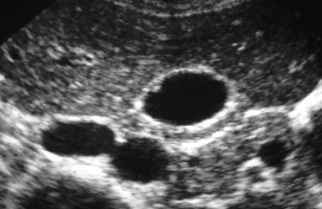 Thickening of the gallbladder wall with a hypoechoic layer, enlargement of the gallbladder lumen, and demonstration of an impacted stone in Hartmann's pouch are all useful diagnostic criteria. Acalculous acute cholecystitis is somewhat more difficult to diagnose, particularly if it occurs in patients in the intensive care unit who are fasting and thus display a dilated gallbladder with sludge. Chronic cholecystitis is typically associated with chole-cystolithiasis, a thickened gallbladder wall and a reduced gallbladder lumen. Mirizzi's syndrome is a complication of chronic calculous cholecystitis: a gallstone impacted within the cystic duct or Hartmann's pouch acts as a foreign body and creates an inflammatory reaction. Stenosis or obstruction of the adjacent common hepatic duct may occur either due to this inflammation or due to direct erosion of the stone through the stone into the ductal lumen, with a subsequent bilio-biliary fistula. The imaging features of Mirizzi's syndrome are 1) bile duct obstruction at the level of the common hepatic duct with 2) signs of cholecystolithiasis and chronic gallbladder disease, 3) a stone at the level of obstruction and, occasionally, 4) a hypervascularized (inflammatory) mass at the level of obstruction. The diagnostic features may be demonstrated noninvasively by means of US, CT, and MR cholangiopancreatography. Nonetheless, the preoperative workup should always include direct cholangiography (either ERCP or PTC) because it is the best technique to demonstrate a bilio-bil-iary fistula. Correct recognition of bilio-biliary fistula is important since it may give rise to postoperative bile leakage if left unrecognized . MR imaging as a soft tissue mass within an asymptomatic gallbladder. 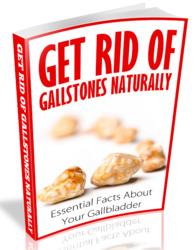 Secondary tumors of the gallbladder are uncommon. Metastases from melanoma may occur within the gallbladder wall and cause typical, rounded mass lesions (Fig. 8).